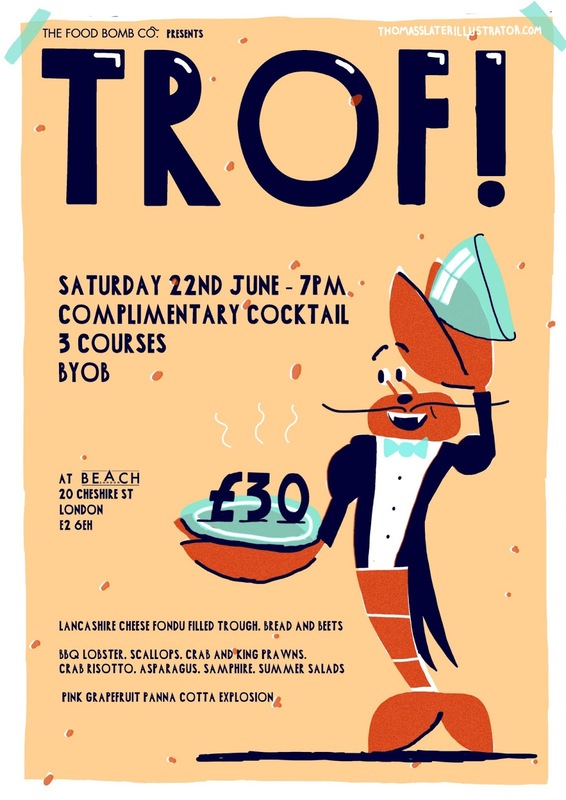 Food Bomb are hosting the first in a series of arty dinners at Beach London's Gallery in Cheshire Street, just off Brick Lane. The first is includes a fondue with Lancashire cheese, BBQ-ed lobster, and crab risotto. "TROF! 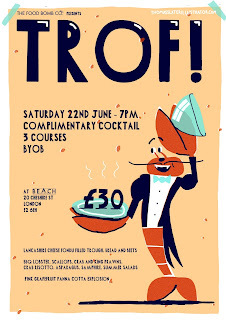 Is the first in a series of monthly Food Bomb events held in Beach London’s Gallery in Shoreditch. This intimate food event in collaboration with Beach brings dining and food ideas set around their current artists show that month. ﻿Launching on Saturday 22nd June at 7pm see’s James Jarvis’ objects in space exhibition the back drop for your enjoyment. Three courses will be shared down one long table, with a complimentary cocktail and BYOB there after. BBQ Lobster, scallops, crab and king prawns. Pink Grapefruit panna cotta explosion"